Where Do Men Actually Talk About Their Health? It’s a fair question to ask, and we found an answer in hockey rinks and dressing rooms. This quintessentially Canadian experience ignited an entire movement and prompted the Locker Room Doctor to take flight. Dr. Tom Ungar, Chief-in Psychiatry at St. Michael’s Hospital in Toronto sat down in studio with 680 News Morning Show host, Geoff Rohoman to talk about the project and how to get men speaking more candidly about their mental health. “My colleague Dr. Mike Evans started this really neat project where he tried to get health messaging and health promotion into the place where guys are actually living and spending their lives so it doesn’t feel weird,” says Dr. Tom Ungar, Chief-in Psychiatry at St. Michael’s Hospital in Toronto. Funded by Movember and the Telus fund, Locker Room Doctor has aimed to consistently answer the questions that men actually have by way of original content. Along with Dr. Tom Ungar, Dr. Alun Ackery and Dr. Ira Smith have been added to the roster, lending their expertise to the conversation. Dr. Ackery is an emergency department physician at St. Michael’s hospital, a teacher at the University of Toronto and works with Ornge air ambulance. And Dr. Smith serves as current medical director for the Toronto Football Club and has also worked with the Toronto Raptors. 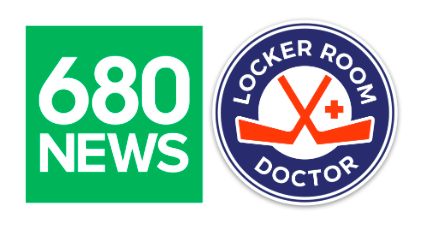 Catch the full interview with 680 News’ Geoff Rohoman right here.